FGF, is a Tallahassee favorite. I can't believe that I have not blogged about it prior. It is one of the local restaurants that I take for granted, recently there were rumors that the restaurant might close (note these were rumors, it is alive and well) and it was then that I made a mental note to do a blog post on one of my favorite local restaurants..
FGF has been open in Tallahassee for over 28 years. 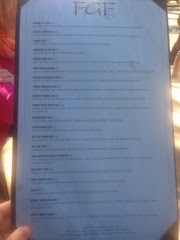 They offer indoor and outdoor seating, and an array of menu items. One of my favorite parts of FGF is their appetizers and desserts. So much so that I often find myself getting just those. 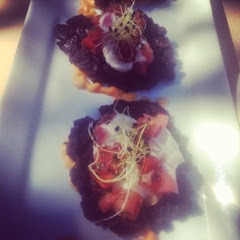 Below are two of my favorites, the Black Bean Cakes, and the Fried Green Tomatoes.. The black bean cakes, are soft, and nearly melt apart when cut. They are layed with fresh salsa, and a dab of sour cream and are placed on a bed of spicy mayo. 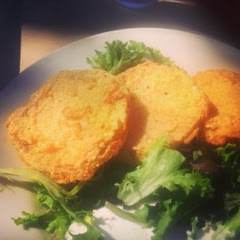 The fried green tomatoes are lightly breaded and served with a great spicy sauce.. If I am not in the mood for appetizers, I often opt for one of their great salads. Below is a photo of the Cobb Salad. 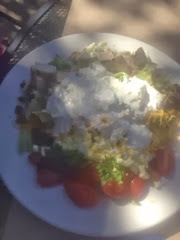 it has Grilled Chicken, Bacon Pressed Egg, Avocado, Grape Tomatoes , Lettuce, Cheaddar Cheese, Blue Cheese Crumbles, and ranch dressing..
Another favorite is the FGF Maison Salad.. which has baby creens, spicy pecans, granny smith apples, goat cheese, sesame and a great vinaigrette dressing.